Keep your comments and cheers coming, and show our athletes your support! In early March I was able to participate in the largest multisport event in the circumpolar north, The Arctic Winter Games. With over 2000 athletes in 20 sports it was a huge effort put together by well over 2000 volunteers. The athletes came from nine different contingents; Team Alaska, Team Yukon, Team Alberta North, Team Northwest Territories, Team Nunavut, Team Nunavik from northern Quebec, Team Greenland, Team Yamalo-Nenets from Russia and the Sàmi people from the Sàpmi region including the countries; Norway, Finland, Sweden and Russia. As an off season training sport I train and compete with the Yukon Cross-Country Ski Team. These races were a great way to test my limits as the competition was harder than ever! Over a period of five days we had four races, two skate and two classic. The first day we had a five kilometre skate race. Five kilometres is one of those distances where you go out hard and just keep on pushing through the pain. It was a tough race for everyone. The second race was a classic 750m sprint. It was a full day starting with a qualifier in the morning and heats in the afternoon. The crowd turn out was great and I sure could hear them all cheering for me! The next day we got a deserved rest day where I barely managed to pull off a 40 minute ski. On Thursday the much anticipated long distance race arrived. We had a ten kilometre classic in fairly snowy conditions. Everyone from the Yukon raced their best and we won a handful of medals! Yukon Skier brings home Gold! The races finished off on Friday with the fun relay event. It was a 3 x 5km skate race. At this point in the competition everyone was exhausted but we went out there and had some fun. It has always been a tradition of the relay to dress up so my team decided to where garbage bags instead of race suit tops. Let’s just say I probably won’t use that idea again. The cultural games came to an end on Saturday evening with a fun and eventful ceremonies. This was my third and final Arctic Winter Games for cross-country skiing but the memories I took from the races and events I will never forget. My favourite cross training for orienteering is definitely cross-country skiing, so much so that I am currently at the Haywood ski nationals in Mont-St. Anne, Quebec. The races started on Saturday with a Team Sprint on the Plains of Abraham, which was a super cool venue. Unfortunately, for this race I was racing at 9:30am, so it was super-duper foggy when I raced, so I didn’t get to see where exactly I was racing. Despite barely being able to see where I was going, or my teammate through the fog, we still did fantastic finishing up in third. Team-sprints are fairly brutal as they consist of a team of two, each person doing three laps of a 1km course. Definitely gets the lactic acid flowing; good practice for running up steep hills in the forest! After this hurt-fest the sun fortunately came out and I could see the magnificent view of Old Quebec while cheering on the rest of the team. Day 1 of racing finished! Sunday was a rest day spent testing klister skis in +15 degree weather. Although warm weather is usually not a horrible thing, it is definitely nicer to race in -5 weather instead. 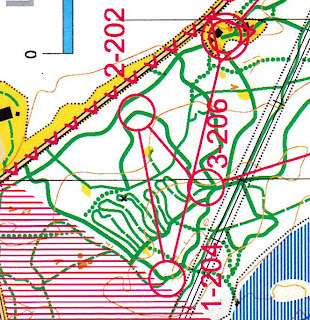 A fair comparison to orienteering is racing in +30 instead of around +15 – it is a lot nicer not to boil while racing. Monday: 5km classic day. Thankfully, I raced at 9:45am before the heat of the day, meaning it was +6 instead of above +10. Although the race being cooler did help, this was still a tough race. Pushing right over the top of every hill was enough to make me collapse and cling to the snow at the finish line gasping for every breath. Glad it paid off though as I was 9th junior Canadian in a very competitive field. Surely every orienteerer knows this feeling of complete exhaustion, maybe minus the snow at the finish line though. This picture pretty much sums up what this nationals have been like so far (minus the 1st day) and most likely will continue to be. 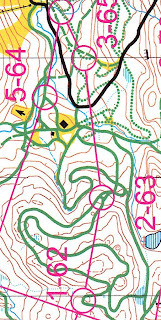 This is a sample map from Slovakia for JWOC 2012. Looks like fun! For the past month and for the next two, I am taking part in an educational exchange to Oviedo, Spain. There is a lot of orienteering in Europe, so before I departed, I got in touch with a coach from here. He said he was willing to let me tag along to a couple of races throughout the course of my stay. As orienteering starts early here (there is no snow), I got my first opportunity this last weekend. Now, Oviedo is in the mountains that cap off the top of Spain, but the competition, which was near Valladolid, was in the typical flat-as-anything central part of Spain. The terrain was really, really different from what I was used to. In addition to the lack of contours, the trees resembled - in my opinion – umbrella trees from Africa. Because they are so tall, have very few branches and are so spaced out, I often had difficulties telling open forest apart from meadow with multiple distinct trees. I found that the map from the first day resembled a paint-spattered canvas of yellow, white and different shades of green. 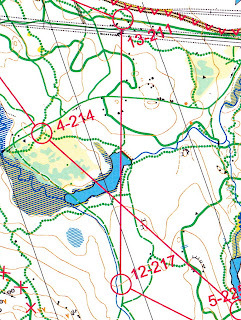 In addition, there were a lot of small, 30 cm high rock piles that were identified as boulders on the map. This added a pepper-shaker feel to the map with at least 400 little black triangles. The weekend was divided into two races. The first, on the Saturday, was a relay event. The team I raced with was comprised of Jimena, a local Spanish girl running the first leg, myself as the Canadian running the second, and Nils, a boy from Germany, finishing with the third. We made quite the international team! I managed to keep my act together for most of the race, although I lost it at times and had to bail to trails in order to relocate. I never realized how much I depend on contours. Without them, my whole orientation strategy had to change! This is the start of the relay. You can see one of the characteristic "boulders" in the bottom right corner. The second day was an individual race. Thankfully, there were contours! I found out that I had been registered in the elite women category, which did not lower my nervousness level. I also found out that the contours were 2.5 m contours with many of them being form-lines. My course was 5.1 km long, and had only 65 m of climb! As I started the race, I found the 1:10 000 scale to be much faster than I was used to. The forest was so open that it took very little time to cover a larger distance. The finish shoot. Even for the smaller races, they have a huge blow-up finish gate! They had an ambulance drive all the way to the finish. Thankfully, it was not needed. A couple of people finishing. The individual race went a lot better than the relay. 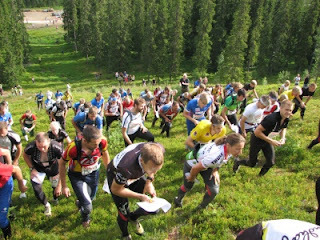 I enjoyed the difference in terrain, as the course took me through both an open meadow area as well as a greener area. The long straight meadows were actually sand tracks. Not quite the same as a well packed trail. The bridge crossing was a path cut through the dark green to allow for passage. A photographer was on hand to catch me land one footed in the creak and clamber up the opposite bank. I'm really happy I got the chance to go to this competition, and I hope I will be able to go to at least one more competition before I return to Whitehorse. What are you doing for mental training? Do you ever get pre-race jitters? Or blow the first control? You might want to supplement your physical training with some mental training. 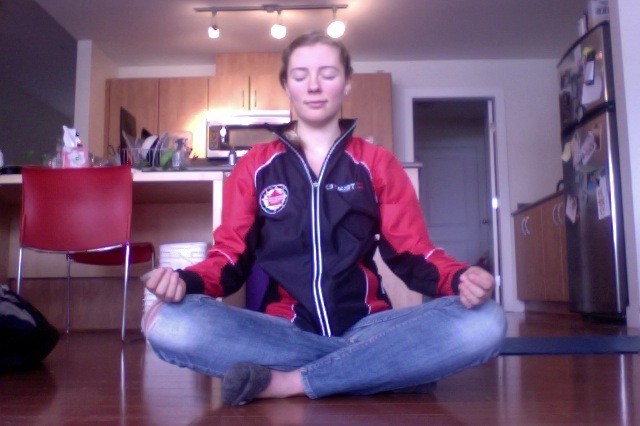 As part of my coaching with Brent (the national junior coach), we’ve been working on mental training and relaxation. (Brent, I hope I’m not sharing our top secret training strategies!) This type of training, like any other, requires lots of practice and progresses through several steps. I’ll outline these steps if any of you want to give it a try! First, pick a quiet place and sit in a chair. It can be done lying down, but it’s better to have your body in the same plane that it will be in before a race. Close your eyes and then start progressively clenching and releasing each muscle. Start with your feet, and then go to your calves, thighs, core, left arm, right arm, shoulders, neck, jaw, and forehead. Make sure you breathe out deeply through your mouth when you release your muscles. If you think it’d be helpful, you can repeat the cycle. Then take several deep breaths at the end and notice how relaxed your body feels. At this point, you can pick a key word (it can be anything like ‘beach’, ‘happy’, ‘warm’) and think about this keyword and connect it to this feeling. After you’ve down this for a few weeks, the next step is to stop the physical clenching. Still go body part by body part, but focus on relaxing your muscles from their existing state. Like before, use your keyword at the end when you’re feeling relaxed. 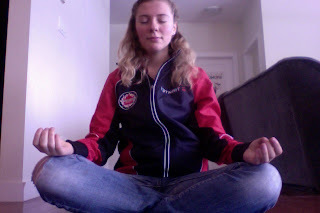 Remember your breathing! The next step is to do total body breathing and relaxing, without going through the individual muscles. Still use your keyword after a few breaths. This is what I’m working on now (with varying degrees of success), so that’s as far as I can tell you what to do. Hopefully you’ll give it a try and find it helpful in both orienteering and non-orienteering situations! Thanks for reading and happy training (both mental and physical)! Elite orienteering in Canada is growing each year and becoming more and more competitive. As more athletes are becoming elite orienteer’s in Canada, competition to make the World Championship team is becoming harder and harder to make each year. In past years there has been limited interest in competing at the World Championships for Canada because of a lack of elite athletes. Currently there are many elite orienteer’s competing to make a spot on the team, which lets us know how far Orienteering Canada has come over the years. This year will probably be the toughest year of all time to make the team. With winter winding down, the competition season is on the horizon. Most of the selection races for the team will be held in May. Many elite orienteers from across Canada will be competing for a spot on the WOC team to represent Canada in Lausanne, Switzerland in the month of July. These races will be the test for most to see if their winter training has paid off and will decide the course of their season. As orienteering grows within Canada, so does the elite competition. Looking forward to a great racing season and competing against start lists loaded with top notch orienteers. Maybe orienteering will be this popular in Canada one day! To be competitive during the orienteering season you need to get good base conditioning training throughout the winter. To perform my best in orienteering I have been ski training and racing with the local cross-country ski club Kanata Nordic, running on my own and with the Ottawa Orienteering Club’s running training, and training and racing ski-orienteering at the local races in Ottawa. In the winter it is important to keep up your orienteering skills, ski orienteering is great for this. Although it is not always as technical as normal orienteering it can be very challenging navigating while traveling very fast on skis. Here are some examples from the races we have had in Ottawa this winter. Our club’s running training is focusing on interval training to improve the running speed for the coming season. Often the interval training is done with a map in hand, even if it is only a simple street map. Using a map helps practice map reading and concentration, and distracts you from thinking about the pain and tiredness of the running. Although most of the running in the winter is done on streets, some of it is done on trails or even in deep snow to prepare for the forest running. 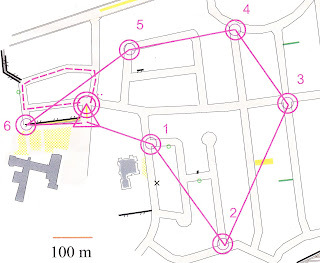 Here is an example of an interval session on streets with rest at each control. The session was done in two laps with different route choices between the controls.